UPDATE: The tax plan Congress passed at the end of 2017 will impact divorce settlements, specifically those involving spousal support. After January 1, 2019, on new court orders that include spousal support provisions, the party paying spousal support will no longer be able to deduct this amount. At the same time, the recipient will no longer have to pay taxes on this amount. Before, the opposite was true, and the payer got an ‘above the line’ deduction; you didn’t have to pay taxes on it. This essentially means there was more money to divide between the two spouses under the old tax code. This may impact the way people negotiate divorce settlements. Some estimate spousal support payments could drop as much as 10% to 15%. However, this large change in spousal support taxation policy does not apply to existing divorce orders, as long as they were entered prior to January 1, 2019. These orders, so long as not later modified, will be grandfathered in at the prior tax policy. So, if you had an order in place before 2019, the old regulations still apply. But if you modify your order now you’re likely subject to the new rules. 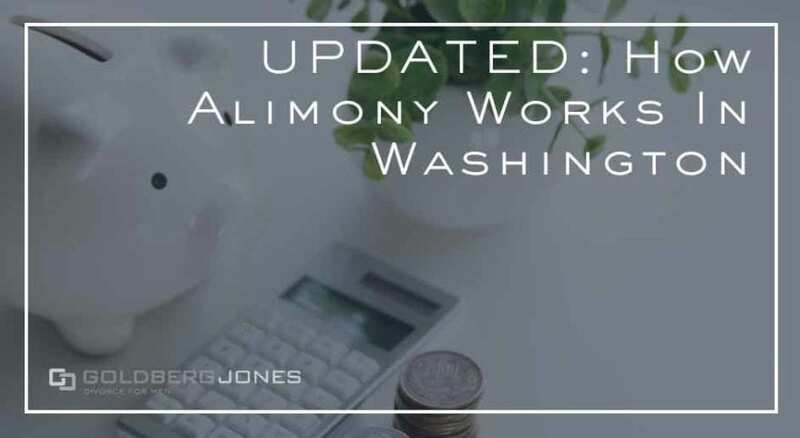 How Does Alimony Work In Washington State? ORIGINAL POST: When it comes time to end a marriage, it may well be the absolute best decision. Divorce often provides the opportunity to get out of a bad situation and move forward in a positive direction. That said, it’s rarely easy and it certainly doesn’t come cheap. A number of expenses pop up during and after the process. Though it depends on your circumstances, one of the most significant costs you may encounter is spousal support. Once you’ve handled the division of property, child custody, visitation, child support, and all the rest, the court may order spousal support. The intent of these payments is to ease financial hardships of the dependent spouse following divorce. Whether or not this happens depends on a variety of factors. It usually comes into play when there’s a discrepancy in the divorce settlement or when one spouse has an additional financial need. If each party has the ability to maintain roughly the same lifestyle enjoyed during the marriage, the court likely won’t bother with spousal support. But if there’s a significant gap from spouse to spouse, it may well factor into the divorce decree. Spousal support regulations vary a great deal from one state to the next. For instance, both Oregon and California have multiple types that the court can award to fit specific conditions. The system in Washington, however, is more fluid and less formulaic. With no uniform criteria, individual judges use a list of factors to decide whether to award spousal support, the amount of these payments, and the duration. They can be temporary in nature or last indefinitely, and payments can be periodic and regular or take the form of a single lump sum. In these cases, the courts have broad discretion. Judges also take the other spouse’s ability to pay into account. Additionally, the court looks at any factors that further influence a spouse’s financial state following a divorce. All of these pieces play a role. The longer the marriage, the more likely the court is to award spousal support. If one spouse financially supported the other, payments may be ordered. In cases where one spouse contributed substantially to the education or financial prospects of the other, the court can also award spousal support. This is most common in situations where one spouse worked to put the other through school, or along those lines. In some cases, the court can award spousal support indefinitely. This most occurs most often when a significant disparity in the earning capacity exists between spouses, one unlikely to ever close. It also pops up in situations where the dependent spouse is unable to work or find suitable employment due to health issues. Unpredictability: Washington’s non-formulaic approach to spousal support means the process is much less predictable than in other states. Since the outcome is far from guaranteed, it makes negotiating a longer, more difficult—not to mention expensive—process. More time in court also generally means additional stress to those involved. Taxes: Tax implications are important to consider in regards to spousal support. How they affect you depends on which side you’re on. If you make payments, the IRS considers these tax-deductible. On the other hand, spousal support payments constitute income for the receiving spouse, and the government taxes them as such. One important thing to be aware of with spousal support is how difficult it is to modify after the fact. To alter an existing order, a significant, unexpected change in circumstances must happen. This can be the loss of a job, receipt of a significant promotion, or similar occurrence. The party filing for the adjustment needs to provide evidence supporting these claims. It can be time-consuming and costly to amend, and even then, the court may resist. Because of this, it’s critical to make sure you understand all the details about your spousal support order before you sign. If you have questions, it’s in your best interest to consult an experienced attorney. A payout now may save you much more in the long run. If both parties settle on terms, it is possible to modify an existing agreement on your own. The exes need to enter into a written contract laying out the specifics. This then requires a judge to sign off to become official. Spousal support payments come to an end if one spouse dies. No one can force you to make payments to the deceased’s estate, nor can you collect payments from their family. If the recipient remarries, that also constitutes a substantial change in circumstances. Payments then terminate by law in Washington, unless otherwise specified in the divorce decree. Finances following divorce have a huge impact on the next phase of your life. Moving forward is so much more difficult when you start off in a preexisting hole. Which is why taking the time and making sure you have the optimal spousal support agreement, whichever side you fall on, becomes so vital. I never work before. I star to get a spousal support for 18 months . Can i get a job at the same time? Hi Martha, thanks for reaching out! I passed your information on to Ken Alan, our managing attorney. He’ll reach out soon with more information about your case. If I move out of state before the divorce is final, will that change the possible decision for alimony or child support? Hi Tracey, thanks for reaching out. That’s an interesting question. I passed your email on to Ken Alan, our managing attorney. He’ll reach out to you soon with a more in-depth answer than we can get into here. If I already have spousal support order finalized and a year later decide to move in with my boyfriend, will my spousal support be decreased? I know it cannot be terminated based on the court order. Hi Christina, thanks for reaching out. That’s a complicated question. I passed your contact information along to Ken Alan, our managing attorney. He will reach out to you with a more in-depth answer than we can get into here.